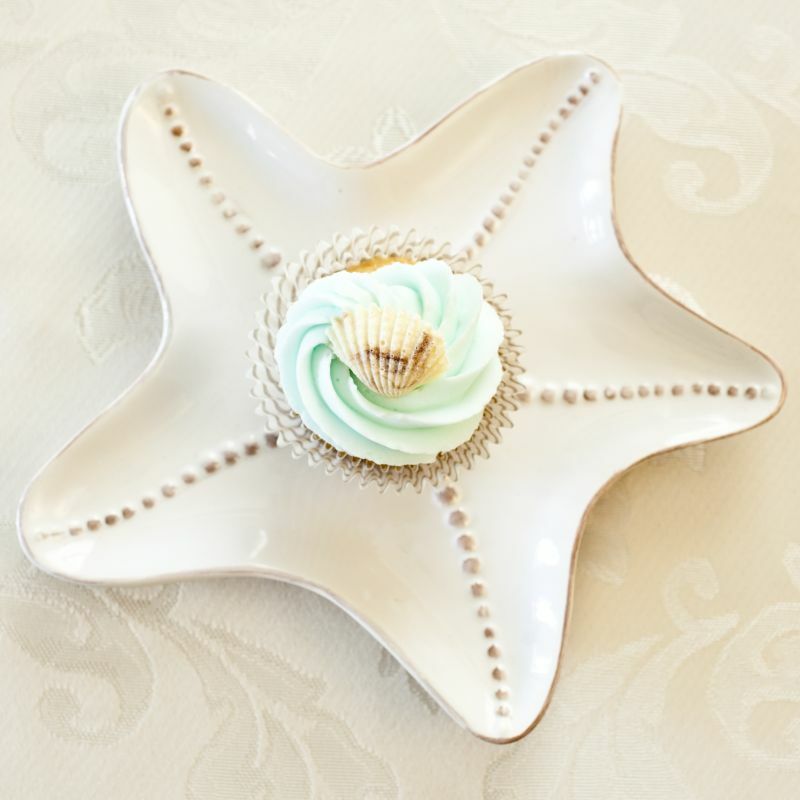 Not much says summer more than seashells and sand. 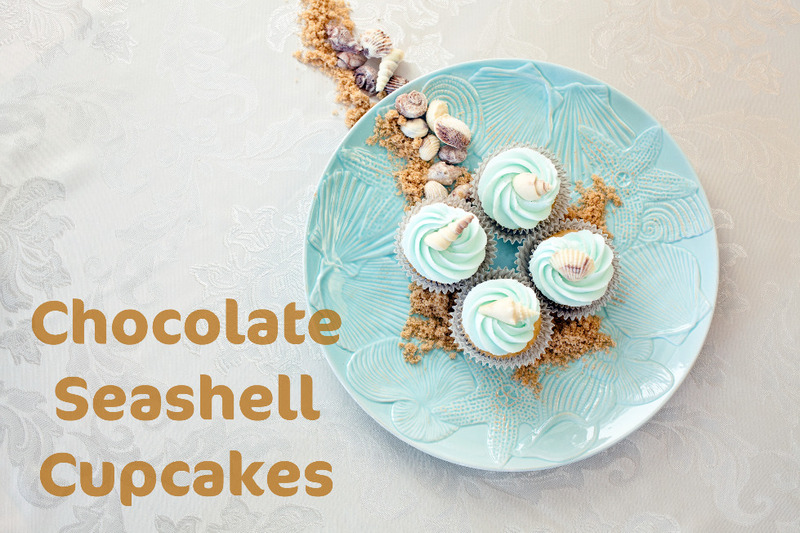 In this case, the ‘sand’ is brown sugar and the ‘shells’ made of white and milk chocolate. I’d been waiting for summer to make these and am finally able to post them. 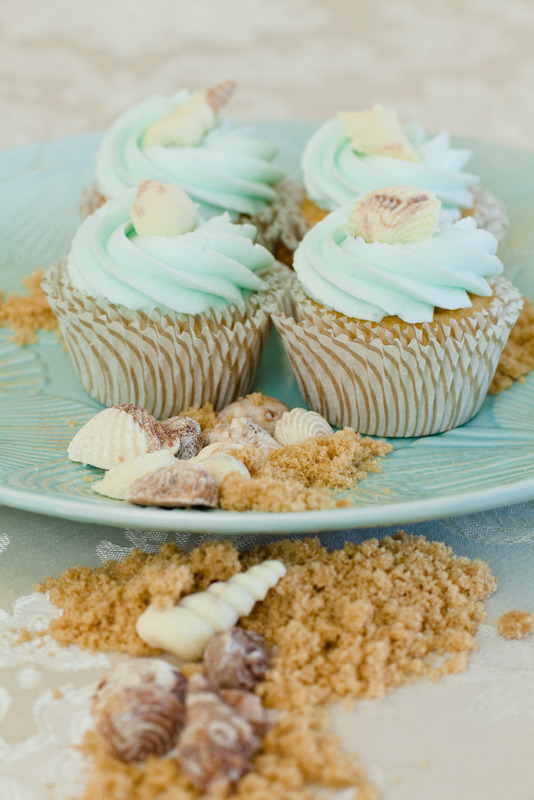 Vanilla cupcakes covered in light blue vanilla buttercream and topped with white and milk chocolate sea shells. The recipes are at the end of this post if you’d like to try making them. Melt chocolate wafers in two of these chocolate melting pots ; one for white chocolate and one for the milk chocolate. If you don’t have the melting pots you could easily use a double-boiler. Spoon the chocolate into a squeeze bottle ; alternating layers of white and milk chocolate. Squeeze the melted chocolate into your chosen moulds. I used this silicone shell-shaped ice cube tray , this chocolate mould as well as a few moulds my friend lent me to make the chocolate sea shells (She couldn’t remember where she got them, but if I find out on my own I’ll come back and post the info. here!). Scrape the excess chocolate off the back of the mould with a pastry scraper . 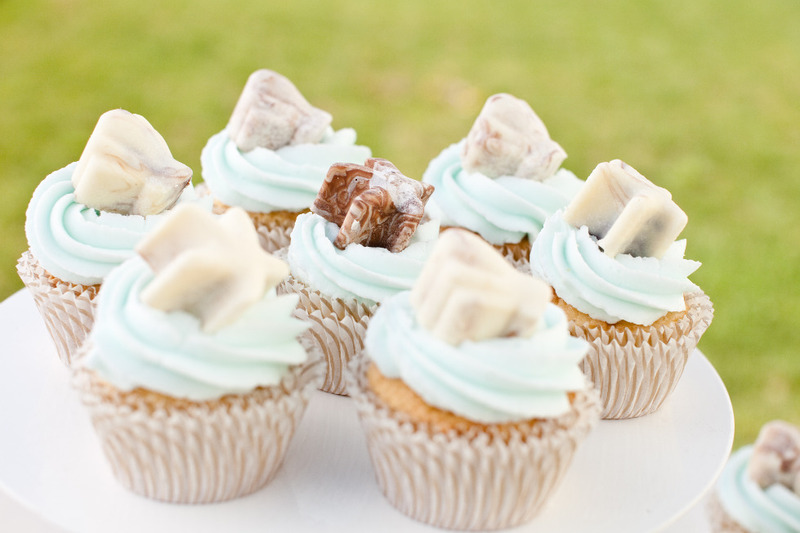 Place your molds in the freezer for approximately several hours or overnight to be completely safe. When you take them out, turn the mould over a cutting board or plate. The chocolates should come out easily, but if they are stuck, gently tap or bend the mold to help them out. I used these gold stripe baking cups to make the cupcakes in and piped the icing with a large star tip . 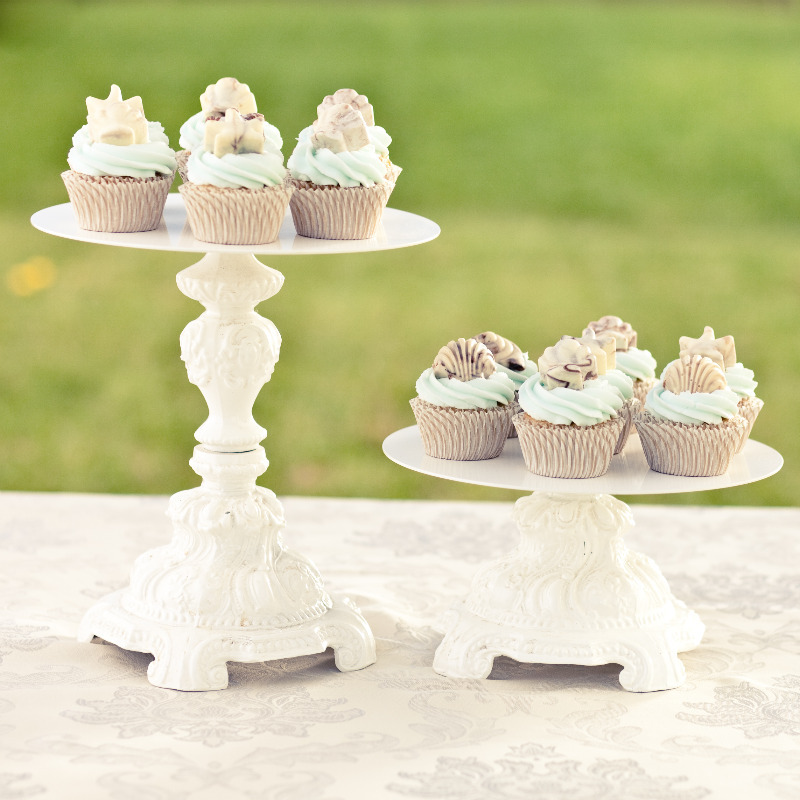 Thank you to Holly’s Sweets & Eats for these fantastic cake stands! She always has the prettiest and most unique stand, platters and gift items. It’s no wonder she recognized me when I finally introduced myself. Another big thanks to Rowell Photography for taking these fresh summer photos! 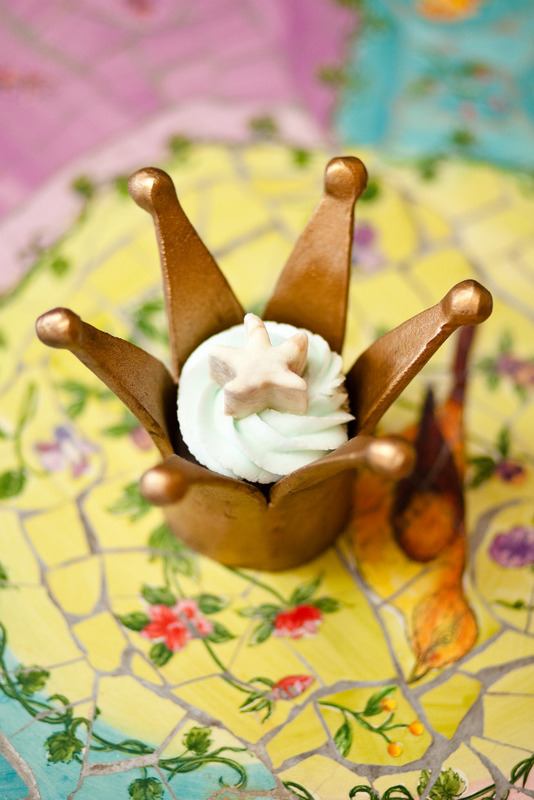 This crown is another item from Holly’s Sweets & Eats. Couldn’t you see a frog-princess type cupcake sitting in it? 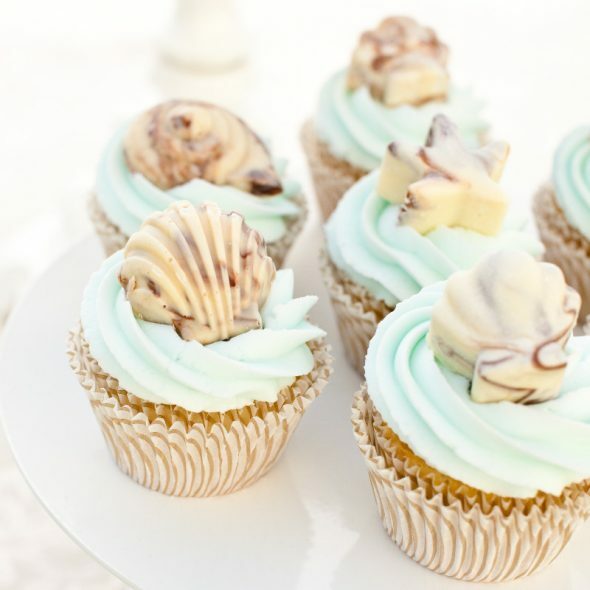 If you’d like to try these cupcakes, below are the recipes I used and here’s a video on making the icing swirl. Combine sugar and egg whites in mixer bowl. Place bowl over pot of simmering water; whisk until hot and sugar is completely dissolved, 3 minutes. Transfer bowl to mixer stand. Using the whisk attachment, beat mixture on high until cooled, about 15 minutes. Using paddle attachment, add butter, 1 tablespoon at a time, until completely incorporated. Stir in vanilla. 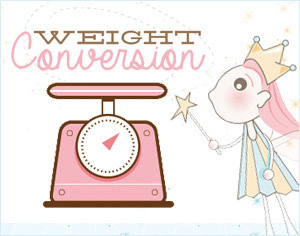 If not using immediately, refrigerate in airtight container up to a week, or freeze up to a month. Bring to room temperature, and rebeat or stir vigorously before using. I recently tried to use chocolate wafers (Merkens) brand to dip my cheese cake pops. The chocolate was too thick and goupy. I usually use lindt regular chocolate to dip strawberries and works great. I cannot figure out what did I do wrong? Hi @ Asmita: Did any water get mixed in there? Even steam or any type of humidity? That can make chocolate clump. these look very pretty ♥ i want to make them for my little nephews but i dont want to serve them raw eggs whites. is there a temp. they need to reach?? I would use a recipe without raw egg whites if you’re making them for young children, and you are concerned. There are more recipes in my recipe section at the top of the blog, which you can choose from. Have fun baking! If you go to where you would leave a reply, look just above the box and it will say “manage the subscriptions of this post”… Click on that and change your settings. All the best! Yes a cake can be covered a few days in advance and stored in the fridge. Take it out to soften a bit before you serve it. How long you take it out for will depend on how hot it is in your area. All the best!